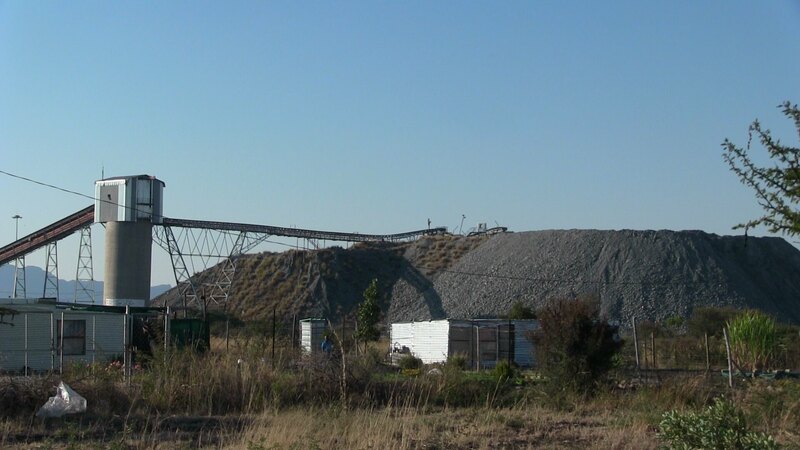 Lonmin mining infrastructure towers over the Bapo Ba Mogale landscape. The local custom of Bapo Ba Mogale in Brits, North West, reserves the right to allocate residential sites to a village headman. At Skoolplaas, a village section in Bapo, an ongoing dispute concerning the legitimacy of headman-ship between the contested incumbent Churchill Madumo and Lesley Maimane has resulted in the invasion of a school ground, as well as dispossession and the double allocation of residential sites in the Skoolplaas section. Per local custom, Lesley Maimane took his kgosana title from his deceased father in April 2009 as his heir. He continued with his kgosana duties until December 2015 when he was demoted based on allegations of disobeying the chieftaincy and having misused funds from stand allocations for his personal gain. “I will fight for my position,” threatens a demoted headman – Maimane. “Once I ascend back to power, I am going to evict each and everyone in this village who was allocated stands by (him).” Maimane is referring to villagers who were newly allocated residential sites by Madumo, one of infamous Lonmin deal signatories and a replacement of Maimane as a kgosana – a village headman. The land of Bapo Ba Mogale is not new to disputes and conflicts: It is at this very land that 34 miners were massacred in what became known as the Marikana Massacre and where Thuli Madonsela, the former Public Protector, conducted a 5-year-long investigation into the alleged systematic looting of community resources. The current Kgosi, Bob Edward Mogale, is alleged to be an illegitimate leader and his chieftainship continues to be contested. Two other traditional councilors, Abbey Mafate and Tshepo Maakane, have been recalled for being critical of the Lonmin deal. In December 2015, at a meeting held at a village level, the Bapo Ba Mogale traditional council introduced Churcill Madumo to the village. However, he had already started with his kgosana duties of issuing sites prior to the meeting. Maimane’s family argues that the replacement of Maimane with Churchill was illegitimate and unlawful according to the local custom. “Mr. Madumo is not from an immediate village but Motlhatbe. He is not a royal descendent. Lastly, we were not properly consulted nor we have received an expulsion letter,” say Oupa Maimane, a relative of Maimane. Madumo, the imposed kgosana, has been allocating residential sites that were already allocated by Maimane. Maimane allocated sites the size of 20 by 40 meters, in comparison to Madumo who allocates sections or portions of those existing sites in sizes of 10 by15 meters. Madumo is accused by the villagers of being responsible for ‘giving land away to outsiders’, and even more so, only to those who are able to afford his set prices. Since it’s a kgosana that reserves a right to allocate sites in Skoolplaas, with one of two contenders purporting to be a rightful headman, the dispute has strained the land allocation process. Land is a vital tool in Bapo and a kgosana has a level of authority over those who reside in his jurisdiction. “We tried to arrest the situation before the development that is here of fenced sites,” says the chairperson of School Governing Body from Bob Edward Mogale Secondary School, Mr. Philip Maake. 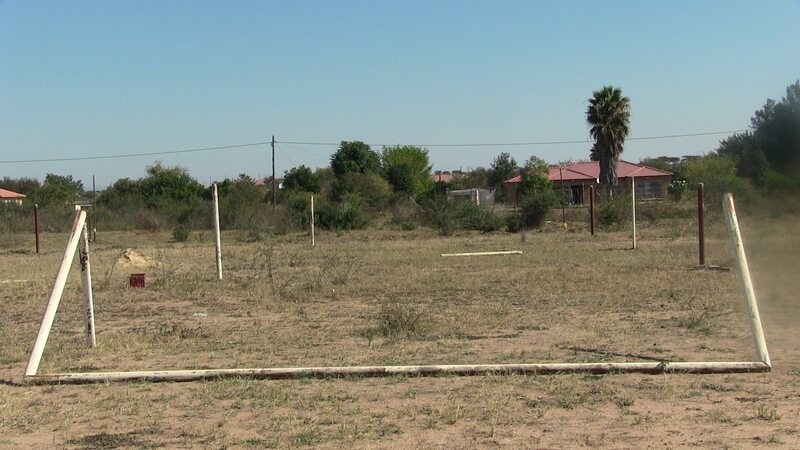 Soccer poles used to mark allocated sites on a school’s football pitch. Caught in the middle of this dispute is a school sports field. The football pitch is being taken by Madumo to allocate residential sites on despite the Department of Education being notified of the dilemma. On this former football pitch, soccer poles are used to mark residential sites. Poles are re-arranged in a close proximity of 15 by 20 meters making a quadrilateral shape marked with long white poles. Other squares are marked with branches of trees, stones, and rusted steel poles whereas others are fenced with silver steel fencing and shining poles. This squares mark stands, or yards, allocated within a school sports ground by Madumo. Inside some of these squares, shacks and bricks houses have been erected. “On the 27th of April, Mr. Madumo came to this portion of land with an entourage of community members who seemed very much desperate to have land, sites of their own,” added the chairperson. Mr Maake said as the school they were ‘never consulted about this.’ There are at least more than thirty stands allocated within this school. “We are charged in terms of South African School Act to be the custodians of the property, building and land that belong to the school,” Mr. Maake continued. There were two schools that operated adjacent to one another, a secondary and a middle school. These two schools were merged in December of 2012 when the principal of the school decided that ‘all pupils should be taught at the secondary school so as to keep better control and oversight.’ The middle school is now used for exam preparations, after school classes, adult literacy and for the Lonmin Skill Development center. A letter was also written to the then MEC of Basic Education in Northwest, Wendy Matsibela, to inform her of the impending risk of occupation and disputes regarding this predicament. According to the chairperson, he exchanged a number of phone calls and emails with the MEC. Unfortunately, the MEC was recently removed and replaced by Mr. Sello Leharie. “The sport ground is for the development of our kids and to remove them from the streets. We will end up addressing our kids. They will attack them. People will lose their lives here while Mr. Madumo sleeps peacefully in Motlhabe,” said Charles Kgoisiemang, a concerned parent. “We are not convinced that the invasion of the school for residential settlement is in a best interest of a learner in our school,” concludes Mr Maake. Waking up to a horde erecting a fence that marks their own yard in your territory, a reality some community members of Skoolplaas, like Barbra Modiselle, are faced with. “This place was a hole. Back in 1980s, constructors dug up a hole on this place to build a road. No one had an interest in this place due to that massive hole. I requested the then traditional council for this site as it is near my parents’ house. I raised funds; I made a donation on my own to hire a service provider to fill that hole. On my expenses, they should have at least communicated with me,” says Modiselle with a disappointed expression. There are signs of prospective occupation inside the yard or erected fence: a toilet dug hole, bricks, building sand and also a rusted steel gate waiting to be put to a fence. “This thing happens because I worked closely with kgosana Maimane. They are doing this to sabotage and spite us”, adds Modiselle. “My great grandfather is one of the people who bought this land and that makes me entitled to live in Bapong,” she continues. “We are not talking to each other anymore with a person who was allocated a land in my stand though we grew up together. “It hurts me, it is painful. It is like losing a child, there is no hope!” concludes Barbara. In Skoolplaas, there is a group called Diphiri – men in the village who meet when there is a passing of a community member. This group arranges for a burial, collects donations and digs a grave. In the absence of a community hall, they were granted a site to meet and raise funds for a hall. These men meet under tree in an open space that they claim as a site they were granted by Maimane to build a community hall. A stand of Diphiri has been allocated and divided into four stands. “This is not the first incident. Previously, we removed people who tried to occupy our place. We removed their fencing,” said Oupa Maimane, a chairperson of Diphiri. “Without knowledge, the recent allocated people have cut down our tree – a tree we use to ring a bell to call a community meeting. This shows they are not from around. These people do not know our custom,” he added. “We are going to remove those fences,” concludes Maimane. Close to Barbara’s stand, Mr David Lephoto, an elder of a village, had a similar encounter on a land he was allocated by Maiame to start a poultry business. Him, Barbara and Diphiri are one of few personal sites that were double allocated or disposed without consent of initial owners. The headman-ship dispute – depending on who the leader is – has a significant impact on the community, causes a lot of upheaval as the powers of allocating land for residential and other purposes at village level is vested in the headman. There is a rising animosity amongst villagers; as others have become beneficiaries of the recent land allocation by the disputed Madumo and others victims due to their sites being allocated and divided without consent. By the virtue of allocating residential stands on school ground without the concern of School Governing Body clashes with developmental plan that school has with the ground, now there is friction of priorities between community settlement and educational plans. The dispute for a school ground and double allocated residential sites in Skoolplaas, directly lay bare the immense instability and damage borne out of the headman-ship dispute, and how – the dispute has strained the land allocation process: villagers desperate for land associate with whoever promises the prospects of residential site. With Maimane convinced to be a legitimate kgosana, he threatens to evict people in Skoolplaas who were allocated stands by Madumo. As Maimane aims for a court case, if he wins and ascends back to power then there will be further divisions amongst the community. Customary law requires the villagers to consent on land usage in the village since Bapong is a communal land, a different reality would be for the persons involved had the process been correctly followed. Therefore, a lack of regulation and accountability gets everyday people caught in middle.